The exclusive set merchandise - now available at the Nitro Store! It's been one year since our servers went online in 2015. But it couldn't be contained to a PC browser game and smart phone application alone. No, Token Ranbu -ONLINE- went on to inspire musicals, stage performances, comics, 2 different anime adaptations, and a wide variety of other mixed media. 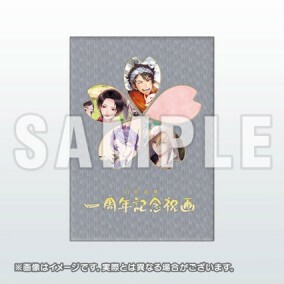 So we're releasing book that collects all the illustrations celebrating our first anniversary, the Touken Ranbu 1st Year Anniversary Commemorative Album, this summer! The "Crest Covered File Folder" is an A4-size file folder covered in the Touken Danshi's crested, with double-pocket design! * The Comic Market 90 event-only bonus, a "Notice" (mini-card with Mikazuki Munechika original illustration), will not be included.